For those of who have been in the loss prevention business for a number of years, you are surely familiar with the retail shrinkage life cycle illustrated in Figure 1. No doubt some of the businesses you have worked in have been around it a number of times. As detailed in the diagram, there are a number of valid reasons why this cycle might occur. On the downward trajectory, you tend to find that there was some form of “tipping point” moment that triggered the business into action— retail shrinkage hit a new all-time high, or some form of business merger led to the need to radically review the way in which retail shrinkage was managed. This in turn can generate energy, enthusiasm, and, perhaps most critically, access to resources. All of a sudden, the loss prevention team starts getting invited to meetings they had never heard of, requests for new equipment no longer get ignored, and the business seems to think that retail shrinkage is exciting and important. This improvement phase can also be facilitated by the introduction of new loss prevention leadership: the new kid on the block with new ideas and plenty of energy and drive who will turn the business around. When you get the business focused and committed to deal with retail shrinkage, chances are that the shrinkage number will quickly come down to an acceptable level–much below the industry average. But this is when the real retail shrinkage-management challenge begins. How do you sustain this low number over a significant period of time? 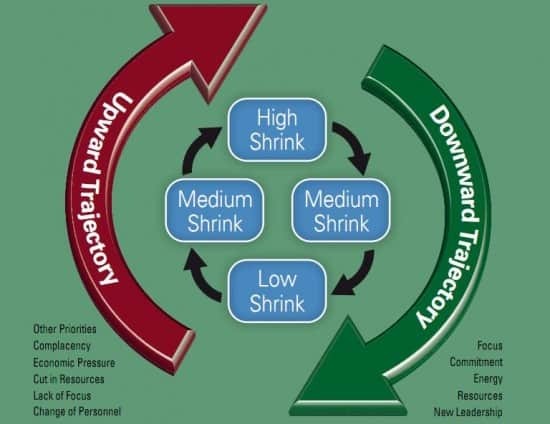 How do you keep shrinkage control as the focus of attention within the business? This is when the factors listed on the left side of the diagram come into play, not the least of which are complacency and lack of focus. Once the retail shrinkage problem appears to be under control, business leaders can feel like they have “done shrinkage” and begin to reallocate resources and prioritize other issues within the business. Other factors can also put shrinkage management in retail under pressure, such as a downturn in the economy leading to generalized cut backs across the business, or the go-ahead loss prevention leader leaves (while the going is good) to take on a new challenge. The culmination of some or all of these factors is that the cost of retail shrinkage begins to rise in the business and the life cycle is once again complete, waiting for the next tipping point to start the cycle all over again. Of course, some retail companies are able to sustain low levels of retail shrinkage over a long period of time. But for the most part, over the last twenty years or so, you will see that the majority of companies have found themselves at various points around the retail shrinkage life cycle, with some unfortunate souls spending the majority of their time at the top. Why does this cycle exist, and what can be done to halt the inevitable slide back to high levels of retail shrinkage? Answering this question was one of the reasons why we decided to write our book on retail shrinkage management. Can we begin to develop an approach that will help organizations to break out of this loop and enable them to keep rates of retail shrinkage at low and acceptable levels? Our starting point was to reconsider what the true causes of shrinkage really are within retail businesses. Much of the history of retail loss prevention has been dominated by the specter of shoplifting (external theft), be it in the form of opportunists stealing for their own personal consumption, so-called professional thieves stealing to make a profit through selling stolen items, or, more recently, the organized retail crime gangs who have seemingly turned stealing into a full-time business. Others have reflected upon the role staff can play in generating retail shrinkage (internal theft), with estimates around the globe varying enormously about how much is due to this, compared to external theft. Indeed, getting consensus on the extent to which the various types of retail shrinkage account for loss within retail businesses is highly problematic. This is due to vastly different definitions of retail shrinkage used by those undertaking retail shrinkage surveys, but also because a large proportion of loss remains unknown, and therefore its causes can only be estimated through guesswork. In our view, trying to understand retail shrinkage from the traditional perspective of identifying which type of thief was responsible is not the best place to start. Instead, we believe that most incidents of internal and external theft, and inter-company fraud (vendor fraud), and virtually all process failures (administrative errors) are actually caused by operational failures within the business. Such failures are the genuine root cause of most of the problems that retail businesses face. We suggest that most incidents of shoplifting or indeed internal theft are merely symptoms of deeper operational failures, and until these failures are identified and resolved, then fixing the problem will continue to be like putting a Band-Aid on a cancer. Outlined in Figure 2 is a schematic showing how we see the relationship between operational failures and retail shrinkage, with the former being the root cause of the latter. The Role of Opportunity. A key part of this thinking is understanding the role of opportunity and how it is created by operational failures and subsequently exploited by thieves. Much criminological research has been undertaken on understanding the importance of opportunity in the way in which it acts as a facilitator of crime. Developments such as situational crime prevention and crime prevention through environmental design (CPTED) have looked at the way in which the environment within which crime takes place can provide opportunities for offenders to exploit. By removing the opportunity you make it much more difficult to commit the crime, less rewarding or more risky for the offender, who is then likely to desist from the behavior. A simple but effective example is the move by the automobile industry to integrate music systems into the dashboards of vehicles. It is now difficult and time consuming to remove them (hence more risky), and there is little generalized demand for the end product (hence little reward). In our view, operational failures are the environment that creates the opportunities for offenders to exploit—if you can minimize the failures, you reduce the likelihood of offenders succeeding. It is also important to recognize that we do not have a dichotomous view of offending, where society is separated into those who are honest and those who are dishonest. We believe that there is an offending continuum where a small minority of people are likely to be at either end of the spectrum either highly unlikely or highly likely to commit an offense, but the rest are somewhere in between and, given the right circumstances, may or may not get involved in criminality. For instance, most people at some point break the law through speeding in their cars, but circumstances usually determine when they do this. If they are being closely followed by a police car, then they are unlikely to go above the speed limit. However, if they are on the open road, perhaps late a night with few other cars around, and they are keen to get home and there are no signs of the police or speed cameras, then chances are they will put their foot down and break the speed limit. The retail space is no different. Creating an environment in which potential thieves feel like they cannot offend with impunity will reduce the likelihood of crime taking place. Defining Operational Failures. So what do we mean by operational failures? We adopt a relatively broad definition that sees operational failures as any fault in the design, implementation, operation, monitoring and control, and review of processes and procedures used within the retail environment. Operational failures can occur at any point in the supply chain from point of manufacture through to the eventual sale of goods to the customer (and beyond in respect of product returns). Let’s look at a quick example. A company may have a procedure in place whereby all high-value goods are to be stored in a secure cage at the back of the store. This procedure, however, is not followed because the only member of staff with the key is on holiday, so high-value stock is left outside the secure cage. Some of this stock is then stolen by a staff member. The outcome of this is a case of internal theft, but the root cause of the problem is that the company has an inadequate procedure in place for dealing with situations where the key holder for the secure cage is on holiday. A dishonest employee has used the opportunity presented by this operational failure to steal stock. Let’s look at another example. A particular (date-sensitive) product is consistently out of stock on the shelf, despite the store regularly reordering the product through manual adjustments to the automatic ordering system. Persistent external theft is viewed as the root cause of the problem. A more detailed analysis reveals that the store has plenty of the items in the back of the store–in fact, too many because of the constant reordering of further stock and much of the product has to then be written off. The problem is that the staff is not able to easily identify the stock in the backroom areas. This is due to the nature of the outer packaging of the product, which makes it difficult to differentiate from other, similar items. It is revealed that the design of the outer packaging, which consists of only a bar code, has been designed for ease of handling in the manufacturer and retailer distribution network. Initial attempts to reduce retail shrinkage on this item could have focused on trying to deal with a perceived external theft issue, such as applying EAS tags, installing CCTV, or even implementing defensive merchandising techniques, such as placing the item behind the counter. However, root cause analysis reveals that an operational failure—in this case, poorly designed external packaging of the product making it difficult for store staff to identify the product—is actually the problem. The solution is not necessarily more security, but instead more thought on how the packaging can be redesigned to enable store staff to quickly recognize the product among the others in the backroom area. A key part of getting to grips with retail shrinkage is to understand the importance of identifying the root causes and not merely the symptoms of the problem, in particular the operational failures that create the opportunities would-be offenders then exploit. It is worth noting that we also view operational failures as the root cause of virtually all the process-failure losses that businesses suffer from. In this respect, they are not creating the opportunity, but more the circumstances within which they take place. Either way, recognizing the importance of operational failures in explaining retail shrinkage is critical. We believe that the key to breaking the retail shrinkage life cycle and sustaining low levels of loss over a long period of time is through what we describe as New Loss Prevention. This is based upon an approach that brings together an understanding of the role of operational failures in generating retail shrinkage together with a business framework for managing loss prevention built around eleven strategic, organizational and operational factors (see Figure 3). This approach is purposefully conceived as a pyramid because all the elements that make up the pyramid need to be in place in order for it to be sustainable. Take out or marginalize any particular factor(s) or block(s) and the whole edifice will come crashing down. 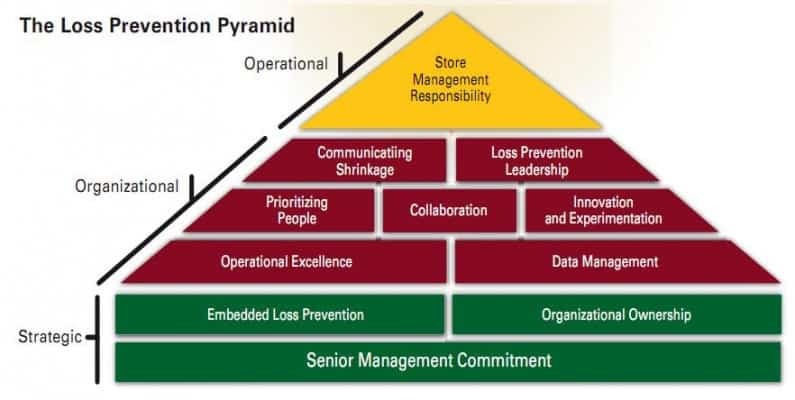 Not only does it represent a sense of the interrelationship between different components that are necessary to deliver effective retail shrinkage management, but it also symbolizes how those who ultimately have to deal with the problem on a day-to-day basis (store teams), reside at the top of the pyramid. Unless the underlying building blocks are in place, such as strong foundations—what we see as the strategic factors—then they will be unable, and more than likely, unwilling to take on this role. While we haven’t got space in this article to go through each of the elements in the Loss Prevention Pyramid in detail, below is a quick review of each of the elements. Setting the Foundations. The bedrock for successfully implementing the Loss Prevention Pyramid is the ability to create, sustain, and embed an organizational awareness of, and commitment to, dealing with the problem of stock loss. This starts at the top of the company with senior management being committed to the concept of loss prevention as an important priority for all parts of the organization and considering it as part of the overall corporate objectives. Without this commitment, the rest of the business will not be persuaded that retail shrinkage matters and is relevant to the organization, nor will the loss prevention department receive the mandate or resources necessary to implement new approaches to tackle the problem. In addition, it is important to ensure that all parts of the organization take ownership of the problem. Many organizations have traditionally viewed loss prevention departments as the sole arbiter on all issues relating to security and retail shrinkage. What we suggest is that loss prevention professionals become the agents of change, working with other functions within the business to develop and operationalize a cross-company response to the shrinkage problem. This seems a far more realistic and sustainable approach given the limited resources available within most loss prevention departments. Moreover, ensuring that this organizational commitment is embedded within the business practices, policies, procedures, and strategic thinking is a vital component of New Loss Prevention (such as through the use of a balanced scorecard). If this is not done, then the essentially ephemeral nature of organizational commitment to tackle retail shrinkage will become apparent. Getting people to not only think about retail shrinkage, but to take responsibility for it is a key part of the Loss Prevention Pyramid. Without these three strategic-level factors, it is clear that any form of loss prevention approach will flounder on the rocks of diffidence, marginalization, and under-prioritization. Getting a broader organizational framework that is conducive to taking loss prevention seriously is imperative. Keeping retail shrinkage on everybody’s agenda through various communication strategies. All of these factors are important in themselves and require a specific plan to ensure they are properly developed and maintained, but they are also highly dependent upon each other. For instance, it is difficult to conceive of an effective communication strategy without having access to high-quality data. Similarly, it is difficult to be innovative and experimental, especially in such a competitive market as retailing, without firm and decisive loss prevention leadership. Operationalizing Retail Shrinkage. The final theme is that of store management responsibility—empowering store staff to take responsibility for dealing with the problem of retail shrinkage. Occupying the very top of the Loss Prevention Pyramid, this can only be achieved if the other factors outlined here are in place. If they are not, then store management will not only have a raft of readymade excuses as to why retail shrinkage is a problem they cannot be expected to take responsibility for, but also they will not have access to the necessary resources and expertise to manage it effectively. Above all, they will not feel confident in developing, delivering, and managing a retail environment within which shopper satisfaction is considered paramount and which achieves the correct balance between selling and security. As detailed earlier, underpinning our thinking is the importance of recognizing how operational failures are the root cause of most forms of retail shrinkage, and this should be viewed as a thread that runs through the Loss Prevention Pyramid. It can be seen explicitly in the emphasis upon ensuring operational excellence…the flip side of operational failure…but it impacts upon many other areas as well. Perhaps more importantly, it is representative of a mind shift away from more traditional ways of dealing with retail shrinkage, which have a heavy reliance upon catching thieves (primarily shoplifters), seeking out yet more technologically advanced panaceas focused more upon the symptoms of the problem rather than the underlying root causes, and viewing the store as the only place in which retail shrinkage occurs. This article was first published in LP Magazine in 2009 and updated November 16, 2016.